By now you’ve probably heard of the term “bit rate” used in connection with MP3 tracks and podcasts, you may even know that higher bit rates give better quality audio. However, like most things in life, nothing is simple and we can further complicate the whole bit rate discussion with variable and constant bit rates. So, what are the pros and cons of these constant and variable bit rates? Choosing a bit rate for a podcast, or an MP3 track, is a bit of a balancing act at the best of times. On the one hand, higher bit rates (variable or constant) give improved audio quality, whilst on the other they lead to bigger file sizes. Introducing yet another variable into the equation, that of constant or variable bit rates, only serves to confuse the situation even further. What then are the relative pros and cons that may affect your choice of type of bit rate to use? If you’re not familiar with bit rates, then my previous post on What are bit rates? should point you in the right general direction and help to get you started. In essence, higher bit rates give improved audio quality, no matter whether variable or constant bit rates are used. However, higher bit rates will always lead to larger file sizes,which in turn lead directly to longer download times and require more storage space. When choosing which bit rate to use for your podcast or MP3 track, you really need to go for the highest bit rate possible, while retaining reasonable file sizes and practical download times. Accepting the fact that you need to choose the highest practical bit rate you can, which option should you go for next (assuming your encoding software gives you the option) constant or variable bit rates? Constant Bit Rates (CBR) are pretty much as their name suggests, where one fixed, or constant bit rate is used for the entire file or track. However, constant bit rates are not optimal as they waste valuable data bits encoding simple sections of audio, and conversely may not use sufficient data bits on more complex audio passages, resulting in poorer audio quality during these sections. The more complex audio sections of tracks encoded with a constant bit rate will be of a lower audio quality compared to the more simple sections of audio within the same track, so a suitable bit rate must be chosen that provides sufficient audio quality for the most demanding sections of the audio being encoded. Constant bit rates are easier and therefore faster to encode compared to variable bit rates and lead to consistent and predictable file sizes. Being an older format, constant bit rates are more compatible with older MP3 players. Variable Bit Rates (VBR) are likewise pretty much as their name suggests, where the bit rate may change throughout the file or track being encoded. Variable bit rate encoding analyses the audio file, adapting the bit rate as it goes to match the complexity of the audio it encounters. For simple audio passages, the system automatically turn its bit rate down, saving valuable data bits, while retaining the perceived audio quality. Conversely, during more complex passages, the system automatically turns its bit rate up, using more data bits to retain the same level of audio quality. Using this method, the average audio quality of a file can be increased as the available data bits are used more flexibly to encode the sound data with increased overall accuracy. When encoding an MP3 track or podcast with the VBR method, the encoding software usually allows you to decide on the overall quality of the resulting track that you desire, after which the system encoder uses the bits required to achieve this defined quality level. Higher quality levels will require more bits. 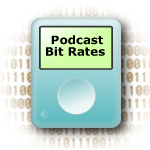 Compared to constant bit rates, variable bit rates produce smaller file sizes for a given audio quality. However, as the bit rates are variable, it’s difficult to predict the size off these files in advance. Variable bit rates are harder and therefore slower to encode compared to constant bit rates, as the adaptive encoding process is more complex an processor intensive. 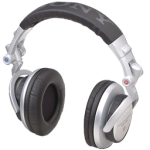 Being a more recent encoding method, some older MP3 players or computer software may not be compatible with variable bit rate encoded MP3 tracks or podcasts. A Constrained Variable Bit Rate (CVBR) is a flavour of variable bit rate, where the maximum bit rate allowed, or the Average Bit Rate (ABR) are predefined. For example, encoding an audio track with the bit rate set to be an average of 128kbps should produce a resultant audio file of higher perceived quality than the same track of encoded at 128kbps CBR, as the ABR file can use data bits it saved during the simpler passages to add extra data bits (above the 128kbps average) to the more complex passages to improve the overall audio quality. Generally speaking, encoding an MP3 track or podcast using a constant bit rate will be better for the sake of compatibility compared to using a variable bit rate, as some older MP3 players don’t support variable bit rates. By way of example, in their guidelines for broadcast media, the BBC recommends the use of constant bit rates for their all of their podcasts and downloadable audio files. If compatibility isn’t a significant issue for you, then you will probably be better off using a form of variable bit rate of encoding to squeeze the best audio quality that you can out of the available bits. Whether you choose to use a constrained variable bit rate, so that you can keep a handle on the size of file you’re likely to get, or go for a fully variable bit rate, is entirely up to you. However, before fixing which method you’re going to use, it may be best to do a few test recordings using different bit rates and bit rate types, before deciding on which suits your purposes best. What are Bit Rates? Popular Audio Compression Formats What is Joint Stereo? How do you Listen to Podcasts? Just would like to share an article on audio encoding optimization for podcasting. No need to think what bit rate to choose the batch file will automatically encode your podcast with the best bit rate to preserve the best quality and smallest file size. The approach was tested on MP3, Nero AAC and OGG. This paper will give you understanding on how one can achieve better compression ratio by bit rate optimization. The key point is that our approach describes a fully automated manner of choosing the bit rate that will preserve the audio quality you define. Read this paper through and find out how to save on size when encoding your podcasts, save on bandwidth when transmitting your audio streams in the network, make more audio tracks fit your memory stick when grabbed from a CD, or store more audio books on your mobile device. This paper will tell you how to save up to 50% on audio file size and up to 50% on the bit rate you encode your audio with still having a descent sound quality. Thanks so much! Everything I needed to know about VBR vs. CBR and more, in a great, easy to understand format. Thank you again! Thanks Daniel, I’m pleased you found it easy to understand. One thing I would like to ask/add. This is the max setting. In other words, I will not loose quality during the complex passages, as you put it. I would have ripped my music as flac, but very few devices support flac, and for that reason, I need to go either wav, or mp3. I chose mp3 for the simplicity, and wide range of devices that supports it, and ID3 ability. Hi Ben, Your assumption about bit rates is certainly correct and CBR is more widely supported on older players than VBR, but a modern high bit rate VBR may give even better quality using higher bit rates in the pieces of music that really need it. FLAC would be the best as you say, but it isn’t very well supported as you also noted. WAV uses huge amounts of storage, so for best quality, with a reasonable size and maximum compatibility I think you have the right choice. To solve this riddle meself, I ripped a song from a favorite CD of mine to WAV, and then to 192kb CBR(constant) and 192kb VBR(variable) mp3s. I then performed Null tests: WAV vs the CBR file inverted, then WAV vs the VBR file inverted. The null for the WAV vs VBR was little more than half as loud(to my ears) as the CBR null, so according to my tests, yes, VBR is the way to encode MP3(or AAC for that matter). I don’t think Variable Bit Rate codecs for lossy formats actually *lower* the bitrate in less complex parts of a song, but I do think that the amount of variablity – UPward – can be controlled in the settings menu of your preferred software(iTunes, Exact Audio Copy, etc.). IE: In my case I selected iTunes 192kbps, VBR “medium” quality. iTunes reported the bitrate of those files as 202-208kbps Variable. Very likely, that is what the bitrate was ‘throttled up'(from 192kb) to during the busier sections of the songs I ripped. In any case, I have actually re-ripped several dozen tracks, just as as an experiment, from constant bit rates of 256kb or higher, down to 192VBR Medium, and have not heard any difference at the lower setting.